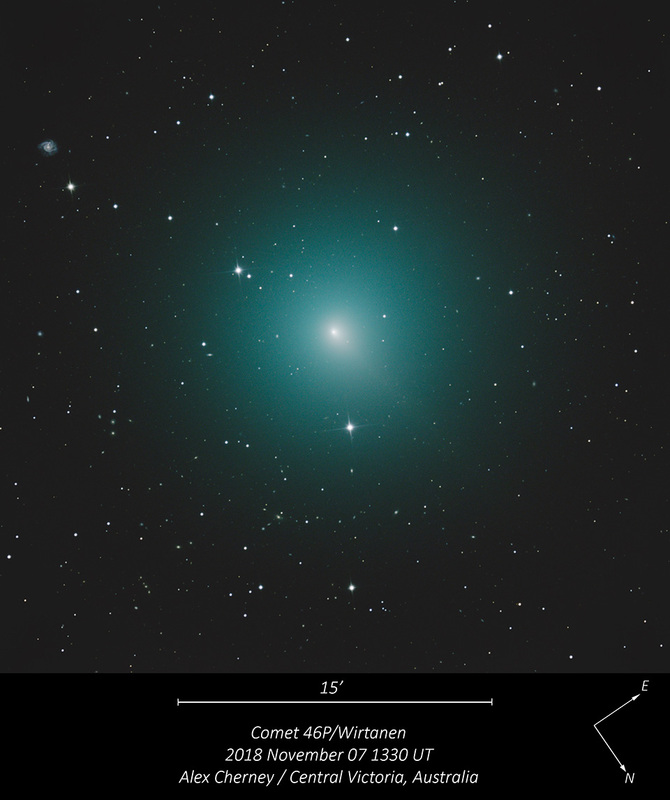 Explanation: Periodic Comet 46P/Wirtanen is now the brightest comet in the night sky, but too faint to be seen by eye. From dark sky sites it could just become naked-eye visible though, as it's 5.4 year long looping orbit takes it closest to Earth and the Sun in mid December. Fluorescing in sunlight, its spherical coma is about half the angular size of a full moon in this southern hemisphere telescopic view from November 7. Then the comet was about 2 light-minutes away or 35 million kilometers from Earth-bound telescopes, so the pretty greenish coma seen here is around 150,000 kilometers across. That makes it about the size of Jupiter. The stack of digital images also reveals a very faint tail extending toward 4 o'clock with a distant background galaxy notable at the upper left. As a regular visitor to the inner Solar System, comet 46P/Wirtanen was once the favored rendezvous target for ESA's comet exploring Rosetta mission. What is the halo made out of? Only because I'm certain APOD wants to be error-free: the second sentence should read "its 5.4 year long looping orbit." destination of the delayed ROSETTA mission, launched on 2 March 2004. <<The composition of water vapor from Churyumov–Gerasimenko, as determined by the Rosetta spacecraft, is substantially different from that found on Earth. The ratio of deuterium to hydrogen in the water from the comet was determined to be three times that found for terrestrial water. This makes it unlikely that water found on Earth came from comets such as Churyumov–Gerasimenko. On 22 January 2015, NASA reported that, between June and August 2014, the comet released increasing amounts of water vapor, up to tenfold as much. 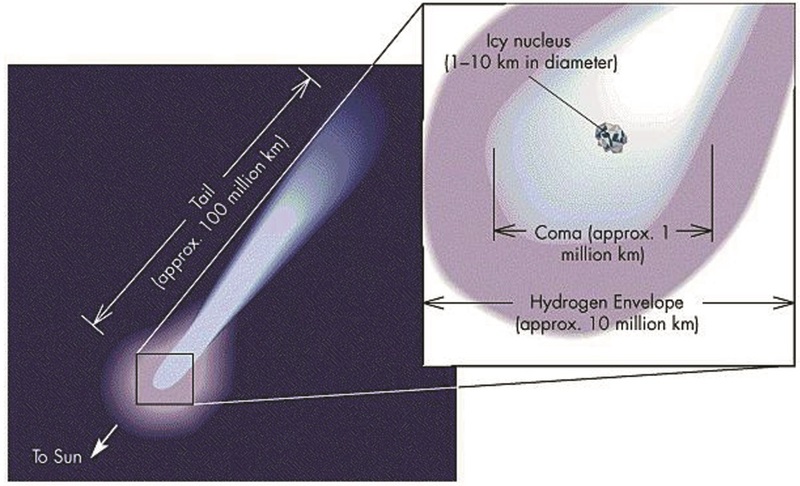 The ALICE spectrograph on Rosetta determined that electrons (within 1 km (0.6 mi) above the comet nucleus) produced from photoionization of water molecules by solar radiation, and not photons from the Sun as thought earlier, are responsible for the degradation of water and carbon dioxide molecules released from the comet nucleus into its coma. Measurements by the COSAC and Ptolemy instruments on the Philae's lander revealed sixteen organic compounds, four of which were seen for the first time on a comet, including acetamide, acetone, methyl isocyanate and propionaldehyde. The only amino acid detected thus far on the comet is glycine, along with precursor molecules methylamine and ethylamine. One of the most outstanding discoveries of the mission so far is the detection of large amounts of free molecular oxygen (O2) gas surrounding the comet. Current solar system models suggest the molecular oxygen should have disappeared by the time 67P was created, about 4.6 billion years ago in a violent and hot process that would have caused the oxygen to react with hydrogen and form water. Molecular oxygen has never before been detected in cometary comas. In situ measurements indicate that the O2/H2O ratio is isotropic in the coma and does not change systematically with heliocentric distance, suggesting that primordial O2 was incorporated into the nucleus during the comet's formation. Detection of molecular nitrogen (N2) in the comet suggests that its cometary grains formed in low-temperature conditions below 30 K.
Last edited by neufer on Thu Nov 15, 2018 5:20 pm, edited 2 times in total. What is that galaxy in the upper left corner? the second sentence should read "its 5.4 year long looping orbit." "Loop-the-Loop" is the name of a new entertainment which goes further in the way of tempting Providence than anything yet invented. The "Loop" is an immense circle of track in the air. A car on a mimic railway shoots down a very steep incline, and is impelled around the inner side of this loop. ... The authorities at Coney Island are said to have prohibited "looping-the-loop" because women break their corset strings in their efforts to catch their breath as they sweep down the incline. That's what I would like to know too! Assuming that it is ~ 100,000 light years across it must ~300,000,000 light years away. What would be truly fascinating would be two supernovas in the same galaxy. More likely foreground stars but double supernovas would make it quite the catch! Indeed...especially two SN of identical brightness and so closely paired. ESO 354-29 among other designations. I, too, doubt that they are double supernovas, just for the sheer rarity of them, but they sure look like they may be just that! Thank you so much, alter-ego!!! I can definitely spot one of the two "supernovas" in the DSS picture provided by Simbad. Actually I can see the second one, too. So sorry Fred, no real supernovas here! The innermost, bright spot is yellow in color and must be a foreground star. The outermost, fainter one is bluish and just might be a huge region of star formation in ESO 354-29. Or else that one too is just a foreground star! Simbad also tells us that ESO 354-29 is an emission line galaxy. This site explains to us that emission line galaxies are still forming stars and are blue in color. Yes, that is fairly obvious from the galaxy's shape and colors, even in the APOD, but thanks for providing the explanation of the term! Simbad also says that ESO 354-29 is an Sc D Hubble type galaxy. 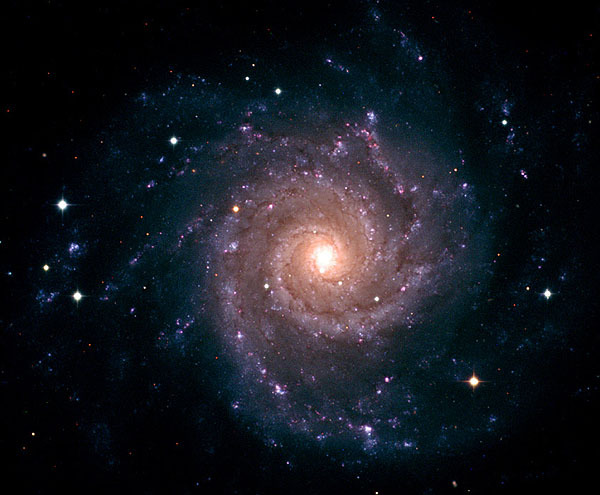 It does look very much like a typical Sc galaxy, like M74. But I don't get the "D". Another mystery! But thank you so much, alter-ego and Fred, for your help in solving the mystery and pointing fascinating details about the galaxy! It's a very nice galaxy too, and the comet is a virtually tailless green blob. Exactly! It's a nice galaxy and a foreground green blob! Of course the galaxy is more interesting than the foreground blob! Have you considered how many little green men might live inside that galaxy? There could be billions! But how many little green men live in or on that green blob of a comet? 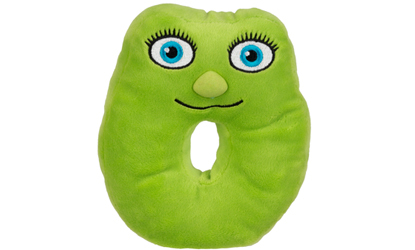 The answer is zero - and not even this green zero-guy is going to be there! Comet 46P/Wirtanen is an icy small Solar System body that, when passing close to the Sun, will warm and begin to release gases, a process called outgassing. This produces a visible atmosphere or coma, and also a tail. These phenomena are due to the effects of solar radiation and the solar wind acting upon the nucleus of the comet. However, this time around, the ion tail will be pointing away from the Earth and difficult to see due to the geometry. It will hopefully improve as the comet approaches perihelion (Dec 12) and perigee (Dec 16). It's a nice galaxy and a foreground green blob! Sometimes you just gotta know! Thanks for that, it's so good to know! I can finally sleep at night! That's good! Now I can finally sleep. I read that this commet is unusually active and now has a coma as broad as the Moon. Please help this poor observer and tell me whert o llok in the sky and when, from North Western UK? A little bit o the old Gallic John? I suggest looking on Sky and Telescopes observing page. Rather not encouraging, "I bet that sighting this comet is going to prove to be a difficult to near-impossible task. And even for those who are blessed with dark and starry skies, finding the comet could prove to be a bit of a challenge"
And directions for looking, " on the evening of December 15th it can be conveniently found passing almost midway between the Hyades and Pleiades star clusters" will be like a signpost for regular star-gazers , but will somebody suggest a compass direction and approximate height at a time, perhaps after sunset, to avoid any time zone mixups? PS did you mean Gaelic?